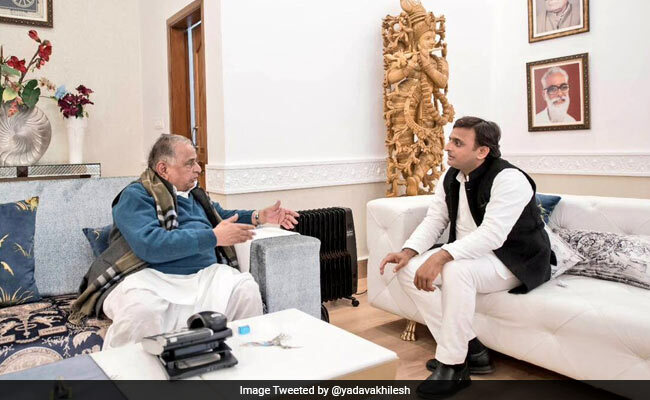 Mulayam Singh's brother and senior Samajwadi Party legislator Shivpal Singh Yadav, Akhilesh Yadav's bitter rival, also did not attend the event. Etawah, Uttar Pradesh: Samajwadi Party's national president Akhilesh Yadav has admitted that his father Mulayam Singh Yadav is "angry" with him, and so did not turn up for the birthday of his uncle Ramgopal Yadav who turned 71 on Thursday. "Netaji (Mulayam Singh Yadav) is not angry with uncle Ramgopal. He is angry with me. Hence, he did not turn up at today's event," Akhilesh Yadav said in Etawah in Uttar Pradesh, while referring to the absence of the Samajwadi Party patriarch from the birthday celebrations. Showering praises on Ramgopal Yadav, the former UP chief minister said, "Uncle had worked to take SP forward. He has saved the party and its election symbol (cycle). It was under the leadership and direction of uncle (Ramgopal) that the government was able to accomplish big tasks and development projects". Akhilesh Yadav went on to say, "The biggest expressway from Agra to Lucknow was completed in record 22 months. Can any government make a highway in such a small time duration?" As Ramgopal Yadav turned 71, senior SP leaders including Naresh Agarwal, Ahmed Hasan, Balram Yadav and a host of other leaders gathered at Saifai Mahotsava Pandal to wish him. Former UP minister Balwant Singh Ramoowalia described Ramgopal Yadav as an umbrella of the party, while Naresh Agarwal said that the Samajwadi Party will register its protest against the new GST regime which will be rolled out on July 1.